Check back soon to see our newly designed, fully interactive website! We will fulfill any meat or poultry requirement. If you have a specific request, please let us know by filling out the form below. Please inquire about our all natural beef marrow bone and poultry neck programs. Dogs Gone Wild is an all-natural, premium raw dog food company. Founded by John and Stacey Seabrook, Dogs Gone Wild is the culmination of many years of research and development of the optimal raw food diet. Inspired by their own Bernese Mountain dogs, the Seabrooks are now offering their raw food mixes to the public so that other dog-lovers can experience the same joy and peace of mind of feeding this product to their dogs. These mixes are now available at your local pet retailer and through various distribution networks. All products in the Dogs Gone Wild raw food mixes contain human-grade, all-natural ingredients with no antibiotics,hormones, additives or preservatives. All raw food is produced in a Baltimore, Maryland area facility. Although dogs are domesticated animals, their stomachs and digestive tracts still resemble that of wolves, from whom dogs are descended. A dog�s digestive system is not designed to eat commercially prepared foods that are processed, baked, based on grains, and loaded with sugar, salt, and additives. Have you noticed that when you eat unprocessed and natural foods, you have more energy and feel healthier overall? Our pets also need unprocessed and natural foods for their well being. A Biologic Appropriate Raw Diet (known as B.A.R.F.) consists of the proper ratios of meat, bones, fat, organs, fruits and vegetables. The food is raw, rather than cooked, in order to retain the high quality proteins, enzymes, vitamins, and nutrients that would be depleted if cooked. Raw food is the most instinctive and natural form of nutrition and reflects what nature intended. 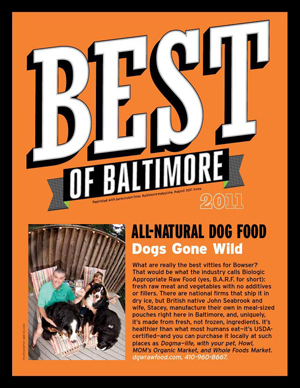 For more information about feeding your special family friends the all natural Dogs Gone Wild raw food diet, contact us at www.dgwrawfood.com or 410-960-8667. "Dogs Gone Wild guaranteed analysis as fed." Check us out in Urbanite Magazine! Copyright © 2019, Dogs Gone Wild. All Rights Reserved. P.O. Box 5616 • Baltimore, MD 21210.